Severe weather blows snow into attic of Parker home. “Thanks for calling New Roof Plus. How can I help you today?” Caller says, “We have water dripping through our bathroom ceiling. We think the roof has a leak.” The “Bomb Cyclone” was a wild storm and caused some unusual problems. This picture is of a home in Parker CO that had snow blow in through a vent on the side of the home. 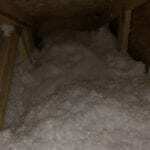 It caused a literal snow drift in their attic. Not good. Roof leaks can be a tricky problem to solve some times. It’s not always an obvious solution. A snowdrift in the attic is a new classic story. For example, water leaks can show up in a bathroom ceiling but the actual leak source could be on the other side of the house! Water follows the least path of resistance. A stream of water can flow underneath the shingles, along the decking until it find a small gap in the decking. Then it could take a new path inside your home and follow that until it drops into your bathroom ceiling. Some leaks can be very slow drips over time as well. These can be a source for mold. But the Bomb Cyclone was special. The Parker roofing problems were not special and many other issues were wide spread across Denver, hitting many people. The image on our blog here is kind of hard to see but the amount of snow that blew in was significant. It took us quite a bit of time to get the snow out before it all melted. As we were working on this home, a neighbor stopped by and said they had the same problem. Sure enough, they had the same model home, facing the same direction and the storm had done the exact same thing to their home. So we went to work on fixing that issue as well. If you have a roofing issue, call us. We are good detectives when it comes to these things.